Since late January Cassini has been acquiring several sets of images that show all of Saturn's globe and ring system at once from perspectives well above and below the ring plane. I enthused about this earlier and posted an amateur version of one of the mosaics and then the imaging team's version of two of the mosaics. For a while I've been meaning to go through the raw images and see just how many of these there are. Well, I finally did it, and the answer is seven complete multispectral mosaics have been captured since January 19, plus several partial ones. Here's a preview of what they will all eventually look like. I just tossed the frames into very quick and dirty mosaics without any attempt to align features or correct brightness and contrast; just this effort took long enough! During the first months of 2007, Cassini repeatedly captured complete surveys of Saturn's globe and its entire ring system from different points of view, as the spacecraft circled above and below the planet on a highly inclined orbit. The left column contains mosaics of raw images, uncorrected for brightness or contrast. The right column contains the carefully mosaicked versions of the images. The global views were captured (from top to bottom) on January 19; January 21; February 5; February 17; February 18; February 19; February 20; February 23; and February 28. The first three and the last two were taken while Cassini was north of the ring plane, so the shadowed side of the rings is visible and the B ring looks dark. The middle four were taken while Cassini was south of the ring plane, so the rings are lit and the B ring looks bright. Saturn appears small at first where Cassini is near its orbital apoapsis, and larger as Cassini approaches periapsis. The phase of Saturn also changes as Cassini orbits around it; Cassini sees a crescent phase near apoapsis, and a full phase just after periapsis. The mosaics in the right column were produced by the Cassini imaging team (Jan. 19 and 21 mosaics) and by Ian Regan (February 20 mosaic). Over time, the Cassini imaging team will likely release more of these as corrected mosaics. I fervently hope that the imaging team will manage to get all of these assembled and released, because each one is a stunner. It's certainly not scientifically necessary to do the painstaking work to assemble these into seamless mosaics. But boy, are these images beautiful. To whet your appetite further, here is Ian Regan's version of the February 20 mosaic, which was taken from a very low phase angle so that we see very few shadows. Because of the nature of the raw images it was tough for Ian to get the subtleties of Saturn's colors -- we'll have to await the official version for the full glory of the color. But this is beautifully seamless and features no fewer than six of the ringmoons. Ian very nearly went insane trying to put this together, poor guy! It took him ten days, he says, and "At times it was an extremely frustrating process indeed; however, as each tile fitted together and more of the finished composite was revealed, I grew ever more excited." I can affirm that once you've started trying to get these assembled, you just can't stop until all those little ringlets are aligned. That's why I didn't even begin to try to correct the ones in my montage above -- I knew that if I started, I wouldn't be able to stop. 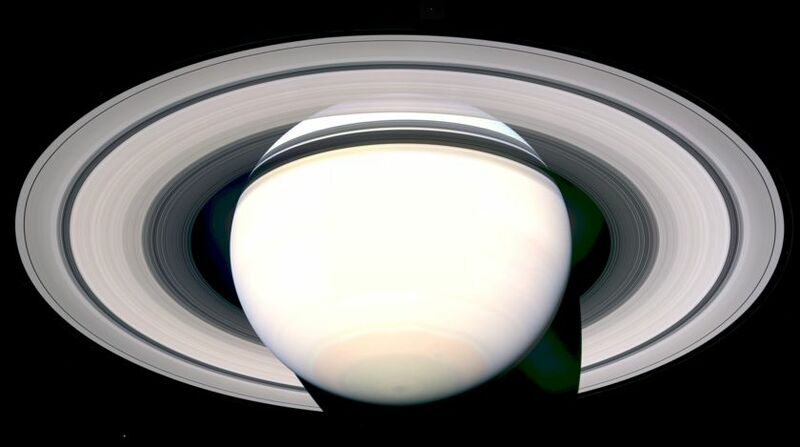 This global view of Saturn and its complete ring system was captured by Cassini on February 20, 2007, and is composed of 15 separate frames. It was assembled from the raw JPEG images by Ian Regan. The view is from the south, so the rings are fully lit by the Sun. It contains nearly all of Saturn's moons from Mimas inward. Clockwise from bottom center: Mimas, Epimetheus (near the left ansa), Pandora, Janus (near the top), and Prometheus (near the right ansa). Anyone else want to try your hand at putting together a Saturn globe?